Different ways to save on translation services, the Translation Services USA way! "Different ways to save on translation services, the Translation Services USA way!" posted on 7/10/2015 at 3:45 PM by Matthew Bramowicz. You’ve tried Translation Cloud’s translation services and you couldn’t have been happier with the results. So why not earn money back on your next translation project through our social media campaign? We’re calling it the “Pay it Forward” deal. Do us a favor by letting people know on your social media that you like our service, and we will return the favor in a form of a $10, $25 or $50 coupon! You can save a lot on your next language translation order. Send us the link to it when ready. 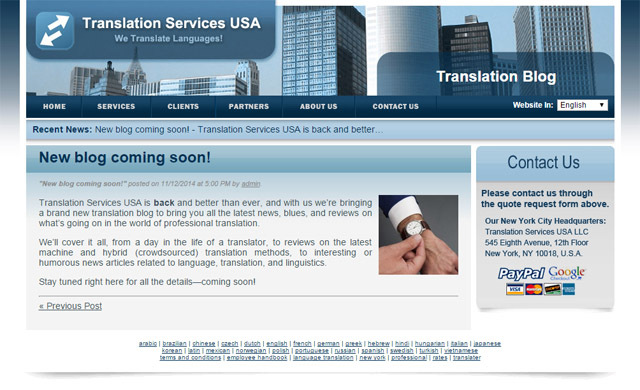 Publish a review of our company, Translation Services USA on your personal or company blog. The review must contain a clickable link to https://www.translation-services-usa.com/ . Send the link of your blog post to us when ready. I prefer Translation Services USA for all my language translation needs. Translation Services USA is a New York City based language localization firm that translates in over 700 languages including some very rare languages such as Jingulu and Puxian, and other ones you’ve probably never heard of! This firm was a winner of the INC 500 Hire Power Award in 2012 when, through the combination of high tech focus and professionalism, it was able to create lots of new jobs in the stagnating US economy. Translation Services USA has pioneered the language crowdsourcing approach with its product called, “Translation Cloud” which was released in 2011 and has become the de-facto application for Fortune 500 firms looking for ways to translate large amounts of text, but not wanting to settle for poor machine translation quality. Or you can come up with something entirely original. It’s up to you! Send us a recommendation letter on your company letterhead. We will gladly use your positive endorsement and will update our client section of the website. A win-win for both of our companies! What to say? Just say how much you’ve enjoyed our service and if you mention how professional and nice we are, we certainly wouldn’t mind! Thank you, and have a great rest of the Summer!